A journey through time, walking among Roman walls, medieval residences and imposing fortifications in two destinations with a rich history. Our excursion begins with a visit to the medieval town of Trogir. Located on an island connected to dry land by a small bridge, it was founded as far back as the 3rd century B.C. by Greek settlers who called it Tragurion or "island of goats". We first head for the walls, extended several times over the centuries, and cross the characteristic little streets lined with stone houses, grand residences, churches and monasteries. We then arrive at the Cathedral of Saint Lawrence, which took four centuries to build. The main façade, created by local architect Radovan and completed in 1240, is considered to be a true masterpiece of medieval art. The bell tower, built in the 14th century, is 47 metres high and constructed in three different architectural styles. At the end of our walk we'll take advantage of some free time to admire the beauties of this magnificent city that has been a UNESCO World Heritage Site since 1997. 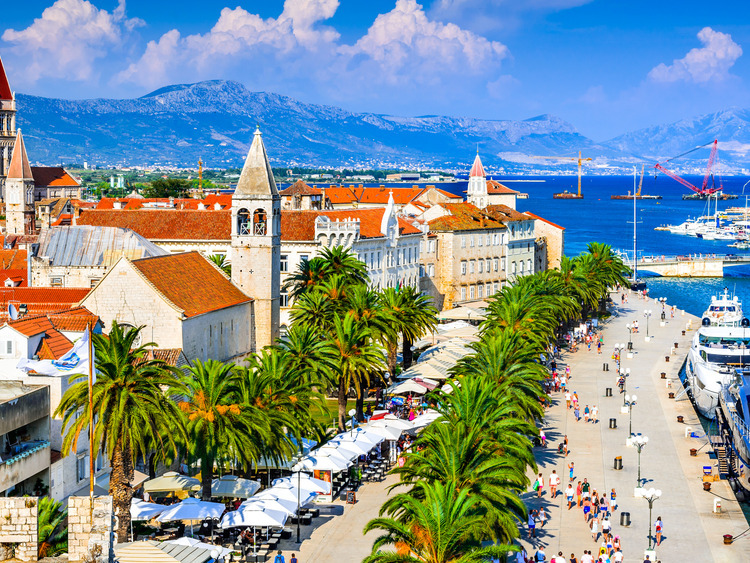 Returning to the coach, we head for Split for a short orientation tour leaving you with some free time to explore on your own or indulge in some shopping before returning to the ship. Dress code that is appropriate for the places of worship to be visited is recommended. This excursion is not recommended for guests with mobility problems. In Split, guests can return to the ship on foot by the "all aboard" time set in the Ship's . Ship's Diario Di Bordo?.